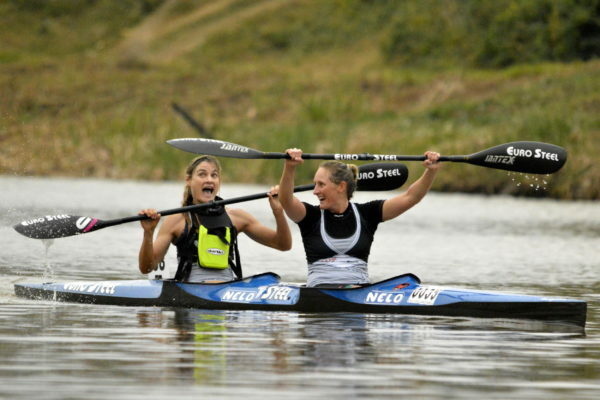 Jenna Ward and Nikki Russell secured their place in the national team to the world championships by winning the Women’s K2 title at the South African Canoe Marathon Championships at Camps Drift on Saturday. Pietermaritzburg – After the record-breaking South African flatwater marathon championships held at Camps Drift in Pietermaritzburg on the weekend, Canoeing South Africa has announced a team of 73 boats to compete at the ICF Canoe Marathon World Championships and Masters Cup events at the same Camps Drift venue from 4 to 12 September. With all the fancied paddlers securing their berths in the team by virtue of finishing first or second in the national championship races that doubled as the one-off trial for the worlds, the South African team is exceptionally strong, and features several World Championship title holders and medallists. The senior men who grabbed four medals at last year’s world title decider at Brandenberg in Germany are all back, albeit with some changes to the K2 crews. Hank McGregor and Andy Birkett, who bagged the historic 1-2 for South Africa last year have retained their places in the men’s K1 team, and will both also feature in the K2 team as well. McGregor will set out to defend his K2 title with his Cape-based partner Jasper Mocké, after winning the national title on the weekend. 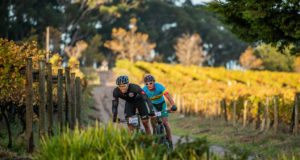 Andy Birkett however, will be racing with classy schoolboy Jean van der Westhuyzen, the winner of the junior world title with Louis Hattingh two years ago. 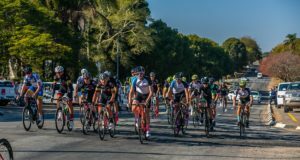 Hattingh has been sidelined by an injury to his left hand suffered during a mishap while woodworking and will not be able to partner Birkett, with whom he won a bronze medal in Germany last year. Jenna Ward will also have a new partner in her boat, after sensationally winning silver with young Kyeta Purchase in women’s K2 while both being under 23 years of age. Ward and her training partner Nikki Russell were sublime in their victory in the women’s K2 title decider in at Camps Drift on the weekend and will take a lot of confidence into the worlds next month. Purchase will be racing the Women’s Under 23 K1 race with Kerry Segal. Daveyton raised Alex Masina was the surprise package in the juniors boys trial, winning the national title emphatically. The teenager, who is now based in Pietermaritzburg to further his canoeing training, was desperately unlucky not to secure a K2 place in the team with the on-form Stewart Little after they broke the rudder off their boat during the Boy’s K2 race. The large South African team includes K1 and K2 craft for the two day Masters Cup that precedes the World Championships, where the Veteran and Masters classes traditionally see a very strong medal haul by South African paddlers.